If you’re trying to build a better small business or searching for a new small business model, blogging may be the answer. Blogging is a great way to demonstrate your expertise in your niche while establishing a brand that distinguishes you from the competition. Creating great content and a distinctive approach are the important ingredients to a quality blog. Join us for a special special BizSugar Facebook Q & A on Monday, February 27th, from 4:30 to 5:30 pm EST with Ileane Smith of Basic Blogging Tips. Entitled “Building A Better Business with Blogging,” our chat will cover some thoughts about how to improve your small business through creating a distinctive blog. With a career in publishing, sales, and promotion spanning over 25 years, Ileane Smith started her blogging career nearly 3 years ago and hasn’t looked back. In that time, she has developed a strong presence in the blogosphere with her popular site Basic Blog Tips and on multiple social media channels including Twitter, YouTube, Facebook and Google+. 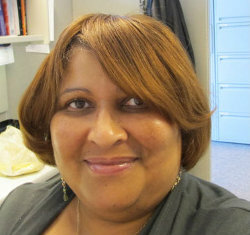 An active member of the Biz Sugar community, she has been named a BizSugar Contributor of the Week. She also serves as advisor for Twitter-based startup JustRetweet. She continues to expand her multimedia reach online with the recent launch of her podcast, Ms. Ileane Speaks, on iTunes. Her goal is to coach bloggers and small business owners, teaching them the tools and techniques to create memorable content that is easy for their audience, including potential clients and customers, to discover. Please join us and learn more about improving your business with blogging. You know I’m loving this! I love ya Ileane always guest blog for ya and I’ll be here to ask a few questions! So tomorrow at 4:30 EST! It’s a date! Looking forward to it! Can’t wait to pose some challenging questions to Ms. Ileane. With blog everything is just better! I enjoy reading your posts Ileane! Thank you! Ileane: I am sorry that I arrived late to the party. Do you have tips on how to create a blogging schedule? I have tip I could give, taken from my new tea site.